I have had a number of firsts in recent weeks, this cake amongst them. Join me as I walk you through my designing, baking and decorating process with this cute birthday cake. This month I made my first Wedding Cake and my first birthday cake for someone I didn't know directly. It's been interesting. And not as stressful as it might have been. I'm not saying it was stress-free mind you! Settle in with a cup of tea folks, this is a long one. Earlier in the year a friend of mine put out a request for raffle prizes to raise money for specialist equipment for her terminally ill son. I offered to make a cake. She had such a lovely outpouring of prizes offered that it was June before the raffle for the cake was drawn. By which point I'd already committed to make a Wedding Cake for 2nd July. I've never made that many special cakes that close together. The winner of the raffle was especially thrilled as her little girl was having her 5th Birthday Party on 9th July. I figured that once I was back from the wedding (we were spending the weekend there) I'd have 4 days to bake and decorate. I hoped that would be enough. I'm not a professional, so I'm sure there are lots of you pro's out there laughing at me being concerned 4 days might not be enough for just 1 cake. So the lovely lady contacted me and we talked about flavours and themes. 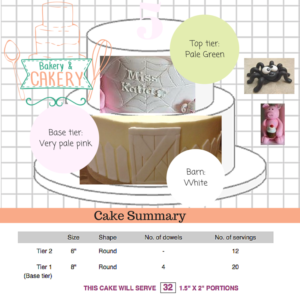 My day job is somewhat creative so I at least knew how to put a brief together to find out what kind of cake to make. I offered a limited series of flavour choices. I wanted to keep this cake well within my skill set. Making a charity cake for a little girls party is not the time to be experimenting outside my comfort zone! I cheekily borrowed some Cake Flavour Picker graphics and put together this flavour choice chart. They opted for a Chocolate Cake with Vanilla Buttercream - a classic combination. I did offer to make them something not on this list if there was a particular cake or icing that they loved. I realise this undermines the point of offering a set choice anyway, but I'm weak like that, ha. I also established the theme of the party, likes and dislikes of the birthday girl, the time and location of the party and any dietary requirements or restrictions. I made the models on day 1 of my 4 days. I haven't made many models before and thought if anything was going to go wrong, it would be them. The pig (Wilbur) I copied straight from a picture I found online and I love how he turned out. Charlotte, I sort of made up. I supported her very thin legs with toothpicks and made them separately. I made little holes in the body to insert them into. Her eyes were little almond shapes, she is a girl spider after all and put her mouth on at a jaunty angle. I didn't get any good photos of her, which is a shame. Her head was one ball and her body another. Sadly she didn't quite survive the journey and her legs started to break at the bend when I was setting the cake up. Knowing I had to feed roughly 30 kids and that I needed to transport the cake just over an hour away I based the cake itself on the She Who Bakes Madeira. At the bottom of her recipe, is the conversion to Chocolate Madeira. You substitute the plain flour with cocoa powder and add melted chocolate. Madeira is a sturdy cake without being dense and firm without being dry. This makes it ideal for layered cakes and tiered cakes. 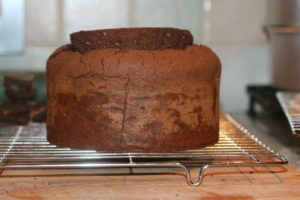 The original recipe is for a 7inch tin but I needed enough for 6inch and 8inch cakes. I wanted them to be at least 4 inches tall when they were finished, so I needed 3 layers of cake at least 1 inch tall. That plus the buttercream filling, outer coat and fondant on top would be roughly 4 inches tall. This would make the stacked cake roughly 8 inches tall. Which I think is impressive to look at. I scaled the recipe up and used the weighed egg method to come up with the following recipe, which filled both my 6 and my 8inch pans nicely. These are the instructions from Britt's She Who Bakes blog, I've augmented them with a few of my own comments and tips, but credit here to Britt. Once the eggs are integrated add in your flour and chocolate powder. Add the vanilla and melted chocolate. Mix for 4-6 minutes on a high speed. Pour mixture into your, lined, tin. Fill to roughly 3/4 full. Add an extra circle of greaseproof paper on top. Once baked, leave in the pan for 5 minutes on your cooling rack. Then turn out onto a sheet of greaseproof paper and leave upside down to cool. This ensures a nice flat top. Once cooled, wrap in clingfilm overnight to ‘settle’. Once split, filled and iced, this cake will last 7-10 days and will freeze well for 3 months. I'd say they turned out well. For the buttercream, I went with my old faithful Swiss Meringue Buttercream. I honestly rarely, if EVER, make standard buttercream anymore. SMBC is light as well as rich. It's a delight to flavour, colour and pipe. It is sturdy and stable and stands up to heat well. This was really important as we've had something of a hot spell this July. I've seen an endless stream of Cake Decorators bemoaning the humidity, fondant woes and melting buttercream. I knew my SMBC would stand up to the heat and taste fabulous. I didn't have any trouble with my buttercream. I chilled it in the freezer for about 30 minutes before I covered the cake. The night I covered my cakes was pretty hot and my fondant threatened to dry out if I didn't work it quick enough. I went for Karen Davies marshmallow fondant. I love MMF and have made my own, but I just wanted to take as much pressure as possible off myself for this cake. I tried Karen Davies Sugarpaste at Cake International last year and thought it was delicious, so I bought a load. It coloured really well, although I did add a little too much pink for my bottom tier. It was supposed to be 'very pale pink' and looked great when I first coloured it. But, of course, food colours mature so it was brighter and deeper than I wanted. The fondant did struggle a little in the heat, and I had to pull all the fondant off and start again on one tier. But if I moved quick enough it went on fine. No elephant skin. There were 2 tiny tears, but I made my first ever batch of Gunge and covered them. It wasn't too bad a job, you couldn't really tell where the marks were. I could, they drove me crazy, but perhaps I'm being too critical. It smoothed well, though, once my fondant smoothers stopped sticking to the tacky fondant. It was hot and humid, so not the fondants fault. I popped a fan on my table and waited. It was a little nerve-wracking but worked out nicely. 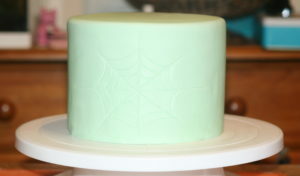 The top tier had an indented and painted spider web pattern. I did this free hand, with a silicone cake tool and painted with some edible Rainbow Dust mixed with Revitiliser. The colour is 'Metallic Light Silver' but it came out MUCH darker than I was hoping. I'll test these things thoroughly in future! I bought a wood grain impression mat and decorated the board with white wood grain. I've wanted to do that for ages, so this was the perfect excuse. I also made a fence panel template out of a flexible cutting mat. My mum (bless her) then helped me, in a little production line of the 2 of us, cut out the fence panels for the bottom tier, emboss them and stick them to the cake. The number '5' was pale pink dots, on a white background, mounted on an oval of pale green. I put a bamboo skewer through the oval for support and to have something to insert into the cake. I cut the little girls name using FMM Funky Letter Cutters, and I desperately wish I had positioned them better. 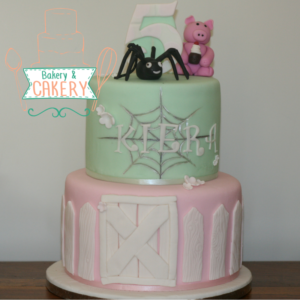 That and I'd stack the top tier so the centre of the spider web lined up with the centre of the barn door. I also cut out lots of little flowers in the pink and white and dotted them all about. I loved that part. If you have any questions or comments about the cake, let me know below.